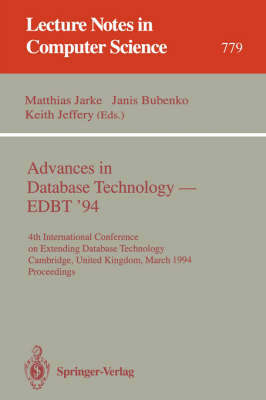 The fourth international conference on Extending Data Base Technology was held in Cambridge, UK, in March 1994. The biannual EDBT has established itself as the premier European database conference. It provides an international forum for the presentation of new extensions to database technology through research, development, and application. This volume contains the scientific papers of the conference. Following invited papers by C.M. Stone and A. Herbert, it contains 31 papers grouped into sections on object views, intelligent user interface, distributed information servers, transaction management, information systems design and evolution, semantics of extended data models,accessing new media, join algorithms, query optimization, and multimedia databases.